The gorgeous Fender Deluxe Jazz Bass 24 V (5-String) Guitar is an upgraded 5-string version of the popular new Fender Jazz Bass 24. It still has the handsomely figured quilted maple top, 24-fret maple neck with abalone dots, high-mass bridge and Basslines pickups and Hipshot licensed tuning machines; the difference is that this model also has a switchable onboard passive/active circuit for added versatility. A real stunner. Sounds and feels as gorgeous as it looks! Fender is very proud indeed to introduce its first 24-fret instrument, and a beautiful one at that – the new Fender Deluxe Jazz Bass 24 Guitar. The sleek body features a striking quilt maple top. The 24-fret maple neck with rosewood fingerboard puts two full octaves at the disposal of adventurous bassists, and the twin Seymour Duncan Basslines pickups deliver everything from whisper to rumble to roar. Fender Jazz Bass 24 Guitar features other special including Hipshot – licensed tuning machines, active electronics with “slap” mid-scoop switch and a high-mass top loading bridge. The American Series Precision Bass guitar that everyone knows and loves is better than ever! The new S-1 switching system makes this an extremely versatile bass that gives players an array of cool new sounds, and it comes in some fantastic new colors and finishes! The American Series Precision Bass guitar features a solid alder or ash body (depending on color) and graphite-reinforced, modern C-shaped maple neck with satin polyurethane finish (available with maple or rosewood fingerboard). With the S-1 system, you can switch the split single-coil pickup from series to parallel, giving the bass a brighter, snappier tone similar to that of a Jazz Bass guitar. The American Deluxe Precision Bass Guitar offers tons of tonal variations. 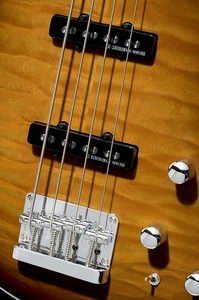 The three-band active EQ, combined with a vintage Precision Bass pickup and special-design humbucking pickup, make this a bass that can cut any gig. It also has new, deluxe lightweight tuners with a lower gear ratio for precise tuning and smooth feel. Available with a maple or rosewood fingerboard. The American Precision Bass guitar that everyone knows and loves is better than ever! The new S-1 switching system makes this an extremely versatile left-handed bass that gives players an array of cool new sounds, and it comes in some fantastic new colors and finishes! The Fender American Precision Left Handed Bass Guitar features a solid alder or ash body (depending on color) and graphite-reinforced, modern C-shaped maple neck with satin polyurethane finish and rosewood fingerboard. With the S-1 system, you can switch the split single-coil pickup from series to parallel, giving the bass a brighter, snappier tone similar to that of a Jazz Bass guitar. Victor Bailey – man, what a resume. First-call session guy. Solo artist. Consummate sideman. And acoustic bassist extraordinaire. Veteran of more than 1,000 recordings by artists including Weather Report, Michael Brecker, LL Cool J and Mary J. Blige. And when Fender started working on Victor Bailey Signature five-string Acoustic Bass, the man himself graciously spent a great deal of time and effort on it with us. The result is an unique instrument! The Victor Bailey Signature five-string Acoustic Bass features a beautifully arched back, figured dao back and sides, a laminated spruce top with a gorgeous dao veneer, an abalone rosette, tortoise-shell binding, a 34″ – scale neck modeled on Bailey’s signature Fender Jazz Bass Guitar, satin gold Hipshot licensed lightweight tuners, Fishman electronics and a deluxe gig bag. A truly stunning instrument.